THE COMPANION: Saidina Abbas RA - The Last Companion of Hijrah. Saidina Abbas RA - The Last Companion of Hijrah. 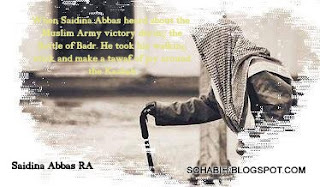 and victorious in the battle of Badr. Rasulullah SAW had 10 or 11 uncles. Four of them earned a great name in history--- Abu Talib, Abu Lahab, Saidina Hamzah RA Ibn Abd Muttalib and Saidina Abbas RA Ibn Abd Muttalib. Abu Talib earned prominence because he brought up his orphan nephew, Rasulullah SAW with great love and care and always supported and protected him. Abu Lahab got the evil reputation because of his enmity with Rasulullah SAW. Abu Lahab always tried his best to destroy Islam. Both Saidina Hamzah RA and Saidina Abas RA Ibn Abd Muttalib embraced Islam and remained firm and strong in their faith in Islam. They could sacrifice anything and take any risk to earn the pleasure of Allah. They proved their loyalty to Islam by their words and deeds, putting their resources and their life at stake to serve the cause of Islam. Saidina Abbas RA ibn ‘Abd al-Muttalib (Arabic: العباس بن عبد المطلب‎). Born in the year 567 CE and was a paternal uncle and Sahabah (companion) of Rasulullah SAW, just three years older than his nephew. A wealthy merchant, during the early years of Islam he protected Rasulullah SAW while he was in Makkah, but only became a convert after the Battle of Badr in 624 CE (2 AH). His descendants founded the Abbasid Caliphate in 750. Abbas, born in 567, was one of the youngest sons of Abdul-Muttalib. His mother was Nutayla bint Janab of the Namir tribe. After his father's death, he took over the Zam Zam Well and the distributing of water to the pilgrims. He became a spice-merchant in Makkah a trade that made him wealthy. Though Saidina Abas Ibn Abd Muttalib was an uncle of Rasulullah SAW there were not much differences in their ages. 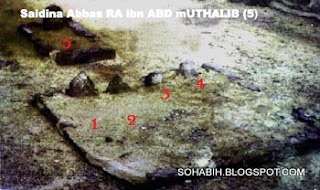 Saidina Abas RA Ibn Abd Muttalib was nearly two and a half years older than Rasulullah SAW Saidina Abas Ibn Abd Muttalib had a great love for his nephew. Wherever they worked together, Saidina Abas RA Ibn Abd Muttalib never allowed Rasulullah SAW to undergo any hard work. Once the Holy Ka’abah was under repairs, everybody from Quraish, young or old took part in this sacred project. Rasulullah SAW and his uncle, Saidina Abas RA Ibn Abd Muttalib were bringing stones along with other children. While working, Rasulullah SAW shoulder was bruised. His uncle Saidina Abas Ibn Abd Muttalib was upset and without any hesitation he took off his own loin-cloth and put it on the shoulders of Rasulullah SAW as a pad to protect him from bruises. Saidina Abas RA Ibn Abd Muttalib Saidina Abas RA Ibn Abd Muttalib love for Rasulullah SAW developed more and more with the age. Even before embracing Islam, Saidina Abas Ibn Abd Muttalib RA supported Rasulullah SAW in every matter. When Saidina Abas Ibn Abd Muttalib RA embraced Islam he devoted himself whole-heartedly to the mission of Rasulullah SAW conveyed the message of Islam to the people in Mecca and invited them to submit before Allah, Saidina Abas RA Ibn Abd Muttalib did not concede apparently but he was fully aware of the impact and implications of the message of Islam and had all his sympathies with it. The Ansaris’ gave assurance of their sincere and wholesale support. Saidina Abas RA Ibn Abd Muttalib was satisfied, and Rasulullah SAW migrated to Madinah after a few days. Saidina Abas RA Ibn Abd Muttalib stayed in Makkah, but his heart was with Rasulullah SAW. At Madinah, Rasulullah SAW conquered Khyber, a stronghold of the Jews. Somebody in Makkah spread the rumors that the Muslims have suffered a smashing defeat in Khyber and that Rasulullah SAW has been taken prisoner and a number of his followers have been killed. When the Makkans made enquiries, they found that the information of Saidina Abas RA Ibn Abd Muttalib was correct. They felt small and humiliated and licked their wounds. Not only did Saidina Abas RA Ibn Abd Muttalib share the sorrows and joys of Rasulullah SAW but he conveyed important news of Makkah to Rasulullah SAW though he was still out of the pale of Islam. In the battle of Badar, Allah bestowed success upon the Muslims. Saidina Abas RA Ibn Abd Muttalib was taken prisoner. He was tied with ropes so mercilessly that he groaned with pain. Knowing him in distress, Rasulullah SAW could not sleep. 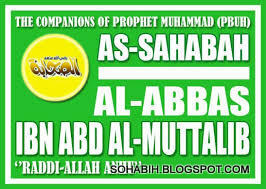 As soon as the holy companions came to know of it, they loosened the bonds of Saidina Abas RA Ibn Abd Muttalib. Such was the love and affection between Rasulullah SAW and his uncle Saidina Abas RA Ibn Abd Muttalib. But in the matter of justice and principles no love and affection did count. When the question of releasing the captives on payment of ransom, arose, Saidina Abas RA Ibn Abd Muttalib was asked to pay a heavy sum of money. In reply, Saidina Abas RA Ibn Abd Muttalib argued that he was a Muslim by heart but could not dare to disclose it because of the situation obtaining in Makkah. The infidels forced him to take part in the battle of Badar. Saidina Abas RA Ibn Abd Muttalib said that he was a poor man. This Plea, too, was not accepted. Rasulullah SAW said “I know you have deposited a big amount of money with your wife,” Saidina Abas RA Ibn Abd Muttalib was-stricken. He said, “By Allah, no one else knew about that money beside me and my wife. No doubt you are the Prophet of Allah”. Then he paid a large sum of money in ransom. This brought release to him and two other captives, his nephew Aqil and Naufal bin Haris. In short Saidina Abas RA Ibn Abd Muttalib stayed in Makkah for a considerable time without publicizing his views. He got permission to migrate to Madinah shortly before the conquest of Makkah. So Saidina Abas RA Ibn Abd Muttalib took his wife and children with him and reached Madinah. There Saidina Abas RA Ibn Abd Muttalib publicly proclaimed that he had embraced Islam. This sent a wave of joy and happiness among the Muslims and Saidina Abas RA Ibn Abd Muttalib began to support the Muslims openly. Jannatul Baqi in Madinah Al Munawarrah. Saidina Abas RA Ibn Abd Muttalib was very wealthy before embracing Islam. 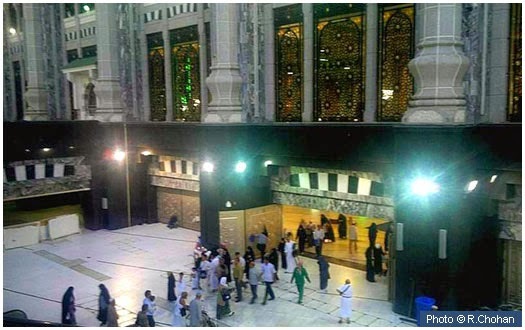 After the death of his father, he took charge of the management of the Kaabah and of providing the pilgrims with water. He performed this duty very efficiently till his migration to Madinah. Saidina Abas RA Ibn Abd Muttalib source of income was trade. Saidina Abas RA Ibn Abd Muttalib lent money on interest. After the conquest of Makkah in 10 A.H. Rasulullah SAW delivered a farewell sermon on the occasion of his last Hajj in which he declared that usury was prohibited (haram) by Allah. After this proclamation all the income of Saidina Abas RA Ibn Abd Muttalib from usury stopped. 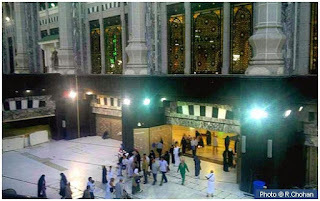 The business in Makkah has already closed at the time of his migration to Madinah. So Rasulullah SAW helped him with the property seized in battles and also gave him some portion of the income from Fadak, a garden which was owned by Rasulullah SAW Saidina Abas RA Ibn Abd Muttalib spent this money very generously. He was a very effective. During the caliphate of Saidina Umar Ibn Al Khattab RA, once there were no rains and the country faced a dreadful famine. Saidina Umar Ibn Al Khattab RA requested Saidina Abas RA Ibn Abd Muttalib to pray for Allah’s mercy. As soon as Saidina Abas RA Ibn Abd Muttalib raised his hands in prayer the clear sky was covered with dense clouds and it rained so heavily that there was plenty of water for a good harvest. When Rasulullah SAW passed away, people went to Saidina Abas RA Ibn Abd Muttalib to offer their condolences. “During the days of Caliph Saidina Umar Ibn Al Khattab RA, some people complained that the water outlet of the roof of Saidina Abas RA Ibn Abd Muttalib opened towards the holy mosque. Whenever it rains the water collected on his roof falls in the courtyard of the mosque and the people offering prayers are put to great difficulty. The Caliph ordered the water outlet to be closed. Saidina Abas RA Ibn Abd Muttalib filed a suit against the Caliph. In his petition he argued that the water outlet was in the same position even during the days of Rasulullah SAW and that it has been closed without his permission. Saidina Abbas RA had at least five wives. 1) Lubaba bint al-Harith (Arabic: لبابة بنت الحارث), also known as Umm al-Fadl, was from the Banu Hilal tribe. Umm al-Fadl claimed to be the second woman to convert to Islam, the same day as her close friend Khadijah, the first wife of Muhammad. Umm al-Fadl's traditions of the Prophet appear in all canonical collections of hadiths. She showed her piety by supernumerary fasting and by attacking Abu Lahab, the enemy of the Muslims, with a tent pole. 2) Fatima bint Junayd, from the Al-Harith clan of the Quraish tribe. 3) Hajila bint Jundub ibn Rabia, from the Hilal tribe. 4) Musliya, a Greek concubine. 5) Tukana, a Jewish woman from the Qurayzah tribe.It is not known whether any of the children were hers. 1) Al-Faraa, who married Qatn ibn Al-Harith, a brother of Lubaba. Her mother is not named. 8) Umm Habib. These seven were all the offspring of Lubaba. 9) Al-Harith. His mother is variously said to have been either Fatima or Hajila. 10) Aown, whose mother is not named,. 11) Mushir, whose mother is not named,. 12) Kathir, son of Musliya. 13) Amina, probably the daughter of Musliya. 14) Safiya, probably the daughter of Musliya. 15) Tammam, the youngest, son of Musliya. Thus in the pursuit of seeking pleasure of Allah, Saidina Abas RA Ibn Abd Muttalib died at the age of 88 in the year 653 CE. He is buried at the Jannatul Baqi' cemetery in Madinah. Among his children Abdullah bin Abbas RA was a renowned companion of Rasulullah SAW. The Abbasid dynasty founded in 750 by Abu al-`Abbās `Abdu'llāh as-Saffāh claimed the title of caliph (literally "vicegerent") through their descent from Abbas's son Abdullah. Many other families claim direct descent from Abbas, including the Kalhora's of Sindh, the Berber Banu Abbas and the modern-day Bawazir of Yemen and Shaigiya and Ja'Alin of Sudan. "When Rasulullah SAW became seriously ill and his disease became aggravated he asked for permission from his wives to be nursed in my house and he was allowed. He came out with the help of two men and his legs were dragging on the ground. He was between Al-Abbas and another man." 'Ubaid Ullah said, "I told Ibn 'Abbas what 'Aisha had narrated and he said, 'Do you know who was the (second) man whose name 'Aisha did not mention'" I said, 'No.' Ibn 'Abbas said, 'He was 'Ali Ibn Abi Talib.' "
Al-Abbas said to Rasulullah SAW "I ransom myself and Aqil." Ali got his share of the booty from the property which was given by his brother Aqil and his uncle Al-Abbas. Some goods came to Rasulullah SAW from Bahrain. Rasulullah SAW ordered the people to spread them in the mosque --it was the biggest amount of goods Allah's Apostle had ever received. He left for prayer and did not even look at it. After finishing the prayer, he sat by those goods and gave from those to everybody he saw. Al-'Abbas came to him and said, "O Allah's Apostle! Give me (something) too, because I gave ransom for myself and 'Aqil" Allah's Apostle told him to take. So he stuffed his garment with it and tried to carry it away but he failed to do so. He said, "O Allah's Apostle! Order someone to help me in lifting it." Rasulullah SAW refused. He then said to Rasulullah SAW: Will you please help me to lift it?" Allah's Apostle refused. Then Al-'Abbas threw some of it and tried to lift it (but failed). He again said, "O Allah's Apostle Order someone to help me to lift it." He refused. Al-'Abbas then said to Rasulullah SAW: "Will you please help me to lift it?" He again refused. Then Al-'Abbas threw some of it, and lifted it on his shoulders and went away. Allah's Apostle kept on watching him till he disappeared from his sight and was astonished at his greediness. Rasulullah SAW did not get up till the last coin was distributed. "The husband of Barirah was a slave called Mughith. It is as if I can see him now, walking behind her and weeping, with tears running down his cheeks. The Prophet (saw) said to Abbas: 'O Abbas, are you not amazed by the love of Mughith for Barirah, and the hatred of Barirah for Mughith?' And the Prophet said to her: Why dont you take him back, for he is the father of your child?' She said: 'O Messenger of Allah, are you commanding me (to do so)?' He said: 'No, rather I am interceding.' She said: 'I have no need of him.' "
That Abdur-Rahman bin Safwan, or Safwan bin Abdur-Rahman Al-Qurashi said: "On the Day of the conquest of Makkah, he came with his father and he said: 'O Messenger of Allah (saw), give my father a share of Hijrah.' He said: 'There is no Hijrah.' Then he went away and entered upon Abbas and said: 'Do you know who I am?' He said: 'Yes.' Then Abbas went out, wearing a shirt and no upper wrap, and said: 'O Messenger of Allah, do you know so-and-so with whom we have friendly ties? He brought his father to swear an oath of allegiance (i.e., promise) to emigrate.' Rasulullah SAW said: 'There is no Hijrah.'" Abbas said: 'I adjure you to do it.' Rasulullah SAW stretched forth his hand and touched his hand, and said: 'I have fulfilled the oath of my uncle, but there is no Hijrah."' (Daif) Another chain with similar wording. Yazid bin Abu Ziyad said: "Meaning: There is no Hijrah from a land whose people have accepted Islam." When the Kaabah was constructed, Rasulullah SAW and Abbas went and lifted stones. Abbas said to Rasulullah SAW: Place your lower garment on your shoulder (so that you may protect yourself from the roughness and hardness of stones). Rasulullah SAW did this, but fell down upon the ground in a state of unconsciousness and his eyes were turned towards the sky. He then stood up and said: My lower garment, my lower garment; and this wrapper were tied around him. In the hadith transmitted by Ibn Rafi', there is the word:" On his neck" and he did not say:" Upon his shoulder." Rasulullah SAW said, "Allah has made Makkah a sanctuary (sacred place) and it was a sanctuary before me and will be so after me. It was made legal for me (to fight in it) for a few hours of the day. None is allowed to uproot its thorny shrubs or to cut its trees or to chase its game or to pick up its fallen things except by a person who announces it publicly." On that Al-Abbas said (to the Prophet), "Except Al-Idhkhir for our goldsmiths and for our graves." And so the Prophet added, "Except Al-Idhkhir. " And Abu Huraira narrated that the Prophet said, "Except Al-Idhkhir for our graves and houses." And Ibn Abbas said, "For their goldsmiths and houses." Allah's Apostle said, "Allah made Makkah a sanctuary and it was neither permitted for anyone before, nor will it be permitted for anyone after me (to fight in it). And fighting in it was made legal for me for a few hours of a day only. None is allowed to uproot its thorny shrubs or to cut down its trees or to chase its game or to pick up its Luqata (fallen things) except by a person who would announce it publicly." Abbas bin Abdul-Muttalib requested the Prophet, "Except Al-Eidhkhir, for our goldsmiths and for the roofs of our houses." The Prophet said, "Except Al-Eidhkhir." Ikrima said, "Do you know what is meant by chasing its game? It is to drive it out of the shade and sit in its place." Khalid said, "(Abbas said: Al-Eidhkhir) for our goldsmiths and our graves." Allah's Apostle came to the drinking place and asked for water. Al-Abbas said, "O Fadl! Go to your mother and bring water from her for Rasulullah SAW." Rasulullah SAW said, "Give me water to drink." Al-Abbas said, "O Allah’s Apostle! The people put their hands in it." Allah's Apostle again said, 'Give me water to drink. So, he drank from that water and then went to the Zam-Zam (well) and there the people were offering water to the others and working at it (drawing water from the well). Rasulullah SAW then said to them, "Carry on! You are doing a good deed." Then he said, "Were I not afraid that other people would compete with you (in drawing water from Zam-Zam), I would certainly take the rope and put it over this (i.e. his shoulder) (to draw water)." On saying that Rasulullah SAW pointed to his shoulder. I went to 'Aisha and asked her to describe to me the illness of Allah's Apostle. 'Aisha said, "Yes. The Prophet became seriously ill and asked whether the people had prayed. We replied, 'No. O Allah's Apostle! They are waiting for you.' He added, 'Put water for me in a trough." 'Aisha added, "We did so. He took a bath and tried to get up but fainted. When he recovered, he again asked whether the people had prayed. We said, 'No, they are waiting for you. O Allah's Apostle,' He again said, 'Put water in a trough for me.' He sat down and took a bath and tried to get up but fainted again. Then he recovered and said, 'Have the people prayed?' We replied, 'No, they are waiting for you. O Allah's Apostle.' He said, 'Put water for me in the trough.' Then he sat down and washed himself and tried to get up but he fainted. When he recovered, he asked, 'Have the people prayed?' We said, 'No, they are waiting for you. O Allah's Apostle! The people were in the mosque waiting for the Prophet for the 'Isha prayer. The Prophet sent for Abu Bakr to lead the people in the prayer. The messenger went to Abu Bakr and said, 'Allah's Apostle orders you to lead the people in the prayer.' Abu Bakr was a soft-hearted man, so he asked 'Umar to lead the prayer but 'Umar replied, 'You are more rightful.' So Abu Bakr led the prayer in those days. When the Prophet felt a bit better, he came out for the Zuhr prayer with the help of two persons one of whom was Al-'Abbas. while Abu Bakr was leading the people in the prayer. When Abu Bakr saw him he wanted to retreat but the Prophet beckoned him not to do so and asked them to make him sit beside Abu Bakr and they did so. Abu Bakr was following the Prophet (in the prayer) and the people were following Abu Bakr. The Prophet (prayed) sitting." 'Ubaid-Ullah added "I went to 'Abdullah bin 'Abbas and asked him, Shall I tell you what Aisha has told me about the fatal illness of the Prophet?' Ibn 'Abbas said, 'Go ahead. I told him her narration and he did not deny anything of it but asked whether 'Aisha told me the name of the second person (who helped the Prophet ) along with Al-Abbas. I said. 'No.' He said, 'He was 'Ali (Ibn Abi Talib).